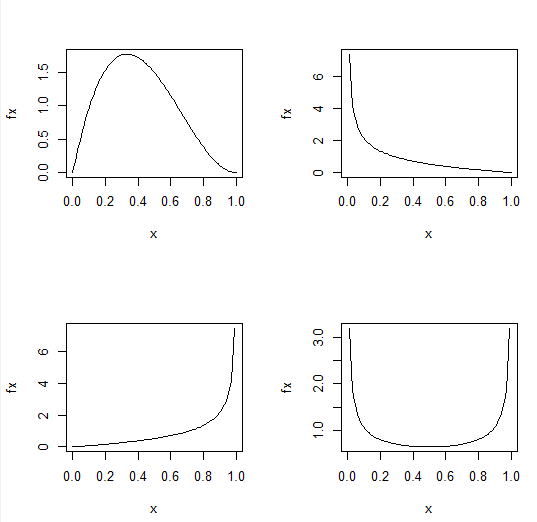 In the last article, we have discussed about continuous probability distribution, today in this article we will discuss the types of continuous probability distribution. Do you know how many types of continuous distribution are? If you don’t know then, don’t worry we will discuss here. 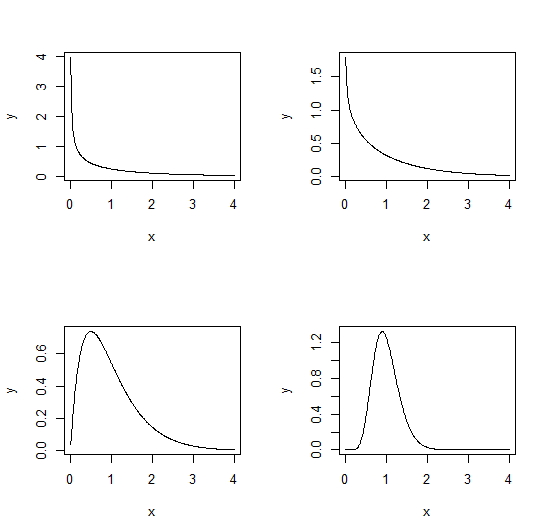 Let’s discuss something about types of Continuous probability distribution. Where m=2, is the basis of an extremely important and famous probability density function. Once it has been scaled, so that the integral (the area under the curve from −∞ to +∞) is unity, this is the normal distribution. 1/β is the rate parameter (β as scale parameter). 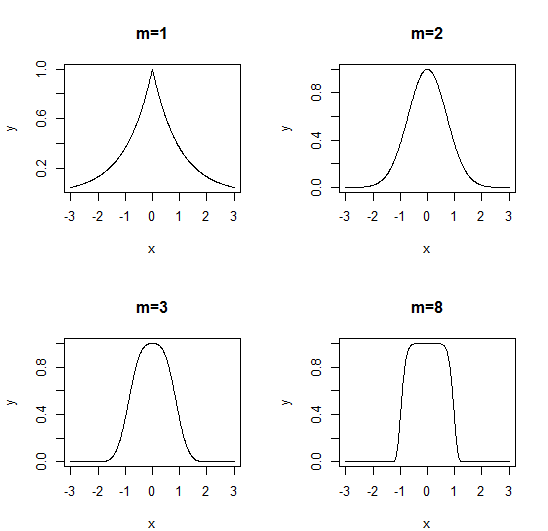 Special cases of the gamma distribution are the exponential (α=1) and chi-squared (α=ν/2, β=2). α<1 produces monotonic declining functions. α>1 produces humped curves that pass through the origin. 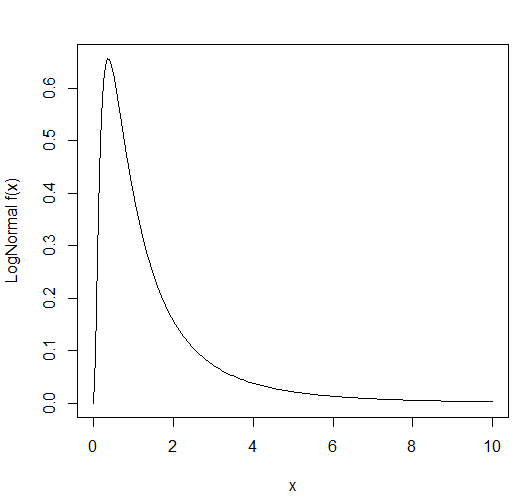 Thus, for the exponential distribution we have a mean of α, a variance of β², a skewness of 2 and a kurtosis of 6. For the chi-squared distribution we have a mean of ν, a variance of 2ν, a skewness of 2√(2/ν) and a kurtosis of 12/ν. We can now answer questions like this: what value is 95% quantile expected from a gamma distribution with mean =2 and variance =3? This implies that rate is 2/3 and shape is 4/3. An important use of the gamma distribution is in describing continuous measurement data that are not normally distributed. where both μ and t>0. The important point is whether the parameters are greater or less than 1. When both are greater than 1 we get an n-shaped curve which becomes more skew as b>a (top left). while for a>1 and 0<b<1 the density is positive (bottom left). The function is U-shaped when both a and b are positive fractions. If a=b=1, then we obtain the uniform distribution on [0,1]. 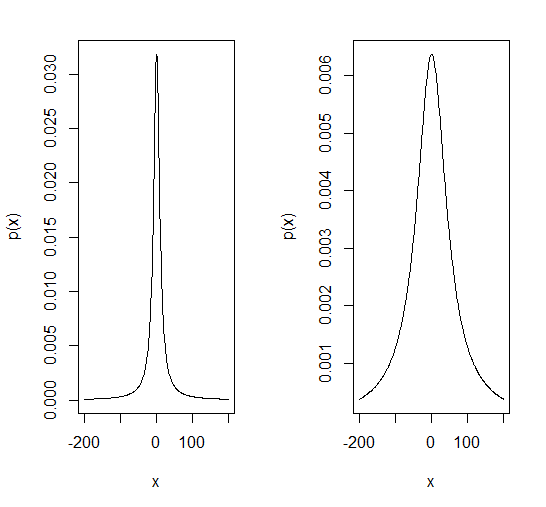 This is a long-tailed two-parameter distribution, characterized by a location parameter a and a scale parameter b. It is real-valued, symmetric about a (which is also its median), and is a curiosity in that it has long enough tails that the expectation does not exist – indeed, it has no moments at all (it often appears in counter-examples in maths books). The harmonic mean of a variable with positive density at 0 is typically distributed as Cauchy, and the Cauchy distribution also appears in the theory of Brownian motion (e.g. random walks). scale =10 and the second plot has scale = 50; both have location = 0.
individually have monotone hazards can create such a hazard function. 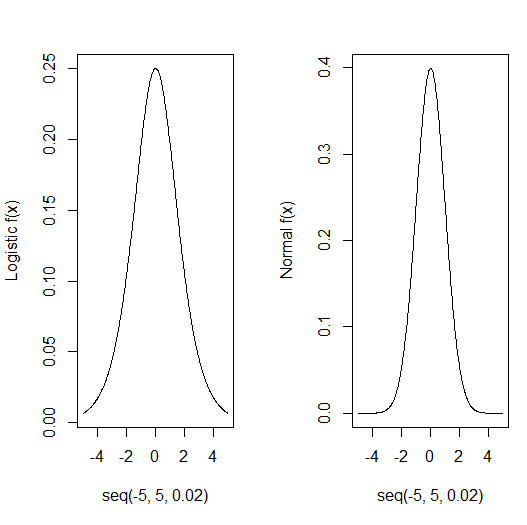 Here, the logistic density function dlogis (left) is compared with an equivalent normal density function dnorm (right) using the default mean 0(zero) and standard deviation 1 in both cases. The much fatter tails of the logistic (still substantial probability at±4 standard deviations. 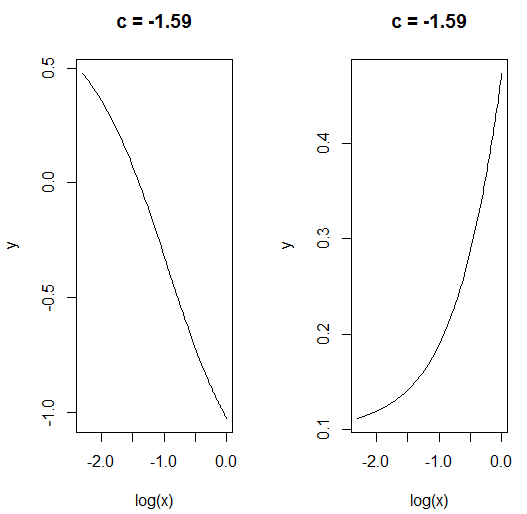 Also the difference in the scales of the two y axes (0.25 for the logistic, 0.4 for the normal). Remaining distribution types will discuss in next article.